How, when and where do we announce the results? We try to announce the results to the winners before the ending of the competition, so that they can register the production rights or patents to their designs. Some winners make use of the express evaluation service in order to learn their results several months earlier to give them the necessary time to register their works, others make use of the express evaluation service in order to start their PR campaign earlier. Normally, design competition results will be published to public immediately at the end of the competition. You might like to check the calendar to see when the competitions finish. Before the results announcement, the preliminary scores could be considered to get an idea about expected award status. Results are communicated by e-mail, and sometimes with postal services to the winners. In most cases we will also be making multi-lingual press releases for general awards announcement and we will also make use of premium press release distribution services. We have a good database of press members worldwide which will receive the results of the competition. For general public, results will be announced at the end of competition deadline. The results will also be published at design magazines around the world. Results will also be available through our publications and press efforts, and also will be available online at this website and others. We have several dedicated webpages and platforms that display the winners in addition to the Winners’ page. Please also remember that winner works will further be physically exhibited (in addition to online exhibitions), this usually happens in Italy, but in many years we were able to move this exhibition to other countries. Furthermore, there is a hardcover yearbook where all professional-entry winner projects are printed, this book is distributed to winners and prominent press members. Furthermore entries will also be published online as well as a digital copy of the yearbook. 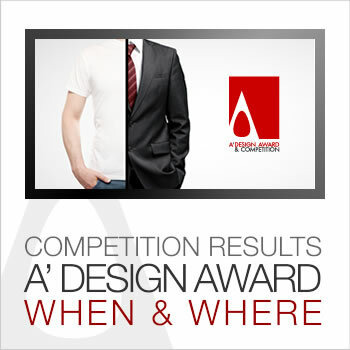 Unique to A’ Design Awards, we feature also “Concealed Categories” which are a bit different; for these categories we do not publish the results online or in any public channels, only the entrants know their results. Most participants who join these categories make a decision based on protection of their designs, trade secrets or for other purposes (for example some entrants join multiple competitions and thus want to keep their results in our competition hidden for a period of time). A’ Design Award has a discounted way of taking part in the competition called digital edition, in which the entry price is highly discounted, however taking part in this way decreases the number of channels where the results are published; i.e. for example digital entry nominations are not included in the hardcover yearbook, learn more about digital entry here.